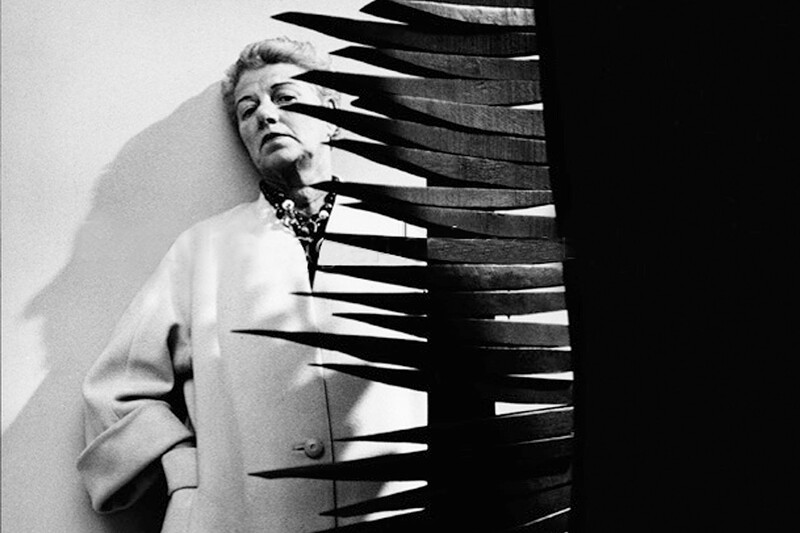 The amazing story of Peggy Guggenheim: Art Addict. Directed by Lisa Immordino Vreeland. Now playing. One of the most captivating movies of 2008, Herb & Dorothy, was a documentary profile of Herb and Dorothy Vogel, a New York City married couple whose lives were completely devoted to contemporary art. Every inch of their modest Manhattan apartment was decorated with their astounding collection of paintings, sculpture, installations, and drawings, diligently and lovingly acquired from the artists themselves. The Vogels were far from rich. Herb (who died in 2012) was a postal clerk, Dorothy a librarian. But they carefully budgeted their incomes to be able to acquire the artworks they admired, and counted the artists as their friends. Compare and contrast the Vogels with the life of Peggy Guggenheim, subject of Lisa Immordino Vreeland’s thought-provoking documentary, Peggy Guggenheim: Art Addict. A member of the same extended family that founded the Solomon R. Guggenheim Museum, NYC native Peggy (1898–1979) was the self-described black sheep of a branch of the family that lost its fortune sometime in the early 1920s. That did not, however, prevent her from moving to Paris at age 23, opening an art gallery, and hooking up with a truly mind-boggling roster of creative types just as “off their rockers” as she was. Make your own list of groundbreaking 20th-century visual and literary artists of the “Lost Generation”: Pablo Picasso, Man Ray, Gertrude Stein, James Joyce, Samuel Beckett, Jean Cocteau, Salvador Dalí, Marcel Duchamp, Ezra Pound, André Breton, Max Ernst, Yves Tanguy, Giorgio de Chirico, René Magritte, Constantin Brâncuşi, Joan Miró, Alberto Giacometti, et al. Ms. Guggenheim either represented them, partied with them, slept with them (she joyfully labeled herself a nymphomaniac), or bought their work. When she fled Europe ahead of the Nazis she moved one of the world’s greatest modern art collections to New York, and eventually to Venice. Her New York pals included Jackson Pollock, Willem de Kooning, Robert Motherwell, and the wife-husband artists Virginia Admiral and Robert De Niro, whose son, the movie star, is one of the film’s talking heads. There’s too much of a “society chitchat” gossipy tone in Vreeland’s archived questions to Guggenheim, but the sheer weight and prestige of Peggy’s connections are something to behold. What she did, no one can do any more.